We carry original DVD movies with english subtitles. 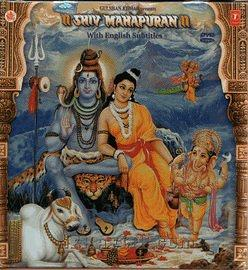 Synopsis for Shiv Mahapuran (12 DVD Set) English Subtitles. Released by T Series. 58 Episodes. Sutji described Shiv Mahapuran - the supreme of all the puranas, which was narrated by Lord Shiva himself and which was later on retold by Sage Vyas with the permission of Maharshi Sanatkumar, for the benediction of common man. Sutji said, "By understanding the mysteries of Shivmahapuran and singing its praises, a man attains greater virtues than that which could be attained by being charitable or by the performance of all the `yagyas'! This item in Specialty Video DVD category was first added to our catalog on 02-24-2015. Buy Shiv Mahapuran (12 DVD Set) DVD, sold & shipped by JSM MUSIC where you can shop online for Hindi Movie DVDs & Bollywood Music Audio CD & MP3, Discounted Indian DVD. This Specialty collection has been tagged as religious dvd, hindu religion, epic tale dvd.